He's also my favorite. I love all of these old drawings you post. I'm sure if you posted everything you had in storage, we all would be overwhelmed with stuff. Keep it up though. It's always good to see new things you dig up. I enjoy the old drawings. Brings me back to a time when the turtles were my life. Dons my favorite, always has been. I agree, please keep posting this sort of drawings up. I really get a kick of just seeing these pin ups on a daily basis. Would Mirage ever consider creating a "the art of" books. I am not sure if this has been created, but it would be so awesome to have a book like this created where you have as many pin ups and character designs collected with all your thoughts and opinions of the art in it.. I would def buy that. So, I hold a proposal. If we can get WB's permission, would it be possible for myself and a few other fans to put together a web project/youtube Special Edition? I don't know how often Steve Barron visits the states, but the first order of business would be to record a commentary. Or if someone can sit him down in England, it can easily be emailed over. Second, is to recieve a copy of all the material he has archived in the form of video footage, home video footage, etc. Once this is all sorted through, at the very least we might be able to put together something in the form of a visual commentary for youtube. Even better if we can get youtube's support and be able to put the full remastered movie on there with the commentary track as a web exclusive. This can all be easily done, but it takes allot of co-ordination effort to do so. -->> ..you can sort of see a slight transition from the more angular TMNT design to the more rounded design Pete uses today here. I dig this one a lot! i am in for that as well!!! sounds like a nice plan and I WOULD LOVE to see the movie footage shot behind the scene stuff if available.. sigh i hope something can be. Bc the fans do want it.. and there is def a demand for this stuff and WB needs to honor the fans who are loyal to the turtles. 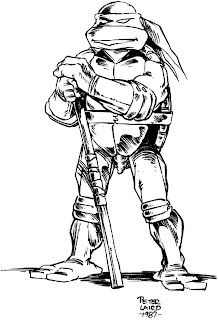 Thanks for posting I love seeing your drawings of the turtles. That is one disgusting looking meatloaf creature - and one fun piece of art! Donnie is also my favorite. Can't wait to see the next movie. If you need any new faces for the movie I would love to be in it. I'd also do it for free. Hi Mr. Laird:So Donatello is your favorite turtle? Mine too!! I start to love him since the original TV series. But I started to love the other one since that watched the 2003 series. To be honest with you, I've have never read the comics. I wish I can found some and start to read them. What is the drink that Donatello is making with his machine in the opening intro sequence to the 1987 series??? I am dying to know?! Is it coffee? espresso? Liquid pizza?? What were you thinking it was when creating it? !